The All Orders EDI Connector is software utility that provides a bridge between All Orders and supported EDI service providers. The EDI Connector is installed on a single computer and runs on demand or can be scheduled to run automatically. The EDI Connector can be run on demand or on timed basis. Customer PO: A customer sends you a purchase order via EDI. The document is received by the EDI provider who translates the document into a format All Orders can read. 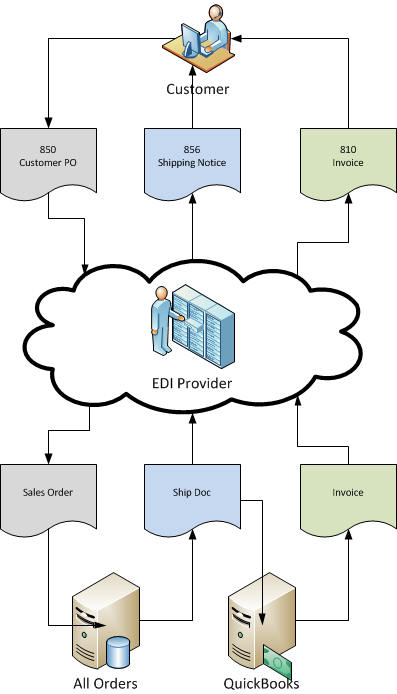 The EDI Connector downloads the PO and will automatically enters it into All Orders as a sales order. Shipping Notice: (optional) Some of your customers will require an Advanced Shpping Notice (ASN). The ASN contains information on the packages (cases or pallets) included in the shippment and which items are contained in each package. Each package uses a special identifier and bar code label using the UCC-128 standard. The ASN is created when the a shipment is completed within All Orders (i.e. a ship doc is created and marked as shipped) . Invoice: All Orders will send the Ship Doc to QuickBooks as an invoice. Our supported EDI serivce providers also have adapters for QuikBooks that will send the Invoice to your trading partners. Take a look at our article to learn more about EDI Documents.